Here, in the low country of South Carolina, some of the best game fishing requires you to kayak or wade into the isolated murky salt water marshes. 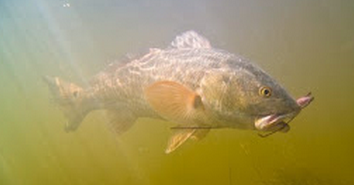 There, you will find the great and tasty Redfish that only sportsmen are allowed to pursue. Sometimes, searching through blogs for the best material seems similar. You must walk in, slog about, cast here and there, until you get a bite. Moreover, Charles had explained that this negative image came from shadows that remained when the pigment flaked away. Shadows? Shadows that remained? You may consider it a plausible hypothesis Charles. However, your plausible hypothesis required your making late-in-the-day qualifying assumptions, not only about total detachment of pigment leaving no traces for STURP to detect by microchemical testing. It now involves some wild speculation about pigment leaving shadows (why? how? what?). As if that were not stretching credulity enough we’re now told that thick paint leaves light shadows and thin paint leaves dark. "Plausible hypothesis" you say Charles, when it involves your building a house of cards, making qualifying assumptions that no one, least of all yourself, would have dreamed up that rider unless or until, er, painted into a corner. Last but not least you are looking to art technologists and historians to verify your hypothesis rather than physicists and chemists. Do you have these people at your beck and call, or will there be more who fail to answer your emails? This not science. It is not even vaguely scientific. It’s an attempt to dress up a dud hypothesis with ever increasing layers of fantasy. Give it up Charles. This is getting you nowhere, and for the rest of us is a serious distraction from the real business of getting to the bottom of that iconic negative image. I knew you would want to see this. As I read Freeman’s essay I respected him for at least trying to be scientific. But it did seem he was arguing from his desired conclusion. I’d like to see examples of how woodcut printing on cloth was done. Are there any examples of ink that left a chemical change on a cloth resembling the shroud? Colin Berry shows integrity in this case, even if his style is more snarky than is needed. These are hypotheses but they are ones which are making sense to people who know about these things and so eventually something acceptable to the scientific community may emerge. No other hypotheses about the making of the images have gained any widespread support, certainly not in any scientific circles, so why not try another in a field that is still open?